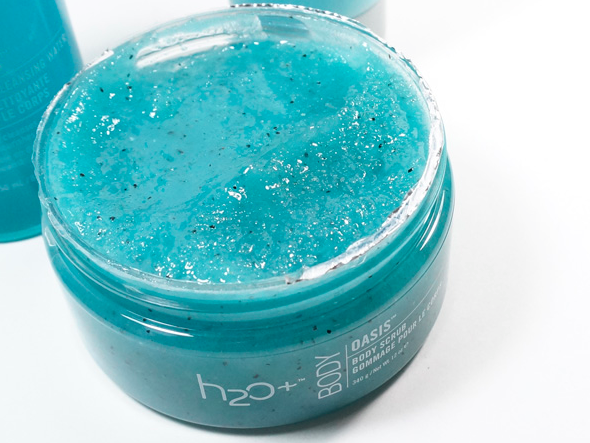 h20+ Oasis Body Scrub: I Love this Stuff! I first discovered h20+ products when I got a bag of them at the Disney Social Media Moms conference back in April. I had actually been looking for a good body scrub for awhile for my boys. We all have dry hands in our house and it was a rough winter. My 10 year old especially would get the dirtiest hands from his dry skin. It wasn’t that he wasn’t washing his hands but the dirt would cling to the patches of dry skin on his hands and his hands were seriously looking dirty ALL the time. I had tried to find a good scrub at a local store without any success but then I brought home the h20+ Oasis Body Scrub ($25, retail). Worked like a charm. Not only did I love this for my kids but also for myself. This product is made up of marine crystals and black rise and they work like a charm to exfoliate. We all fight over this product in our family now – seriously. So it retails for $25 but you can always find great beauty deals on Ulta.com, Ulta.com currently has the h20+ Oasis Body Scrub on sale for $18.75.